Indonesia was subjected to international scrutiny of its human rights record during the UN’s Universal Periodic Review today. Dozens of international NGOs submitted briefings detailing a litany of abuse by Indonesia in the Papua provinces, before 90 countries asked questions and offered recommendations to Indonesia regarding its human rights record. Indonesia’s double standards on press freedom were also criticised as Jakarta hosted World Press Freedom Day. 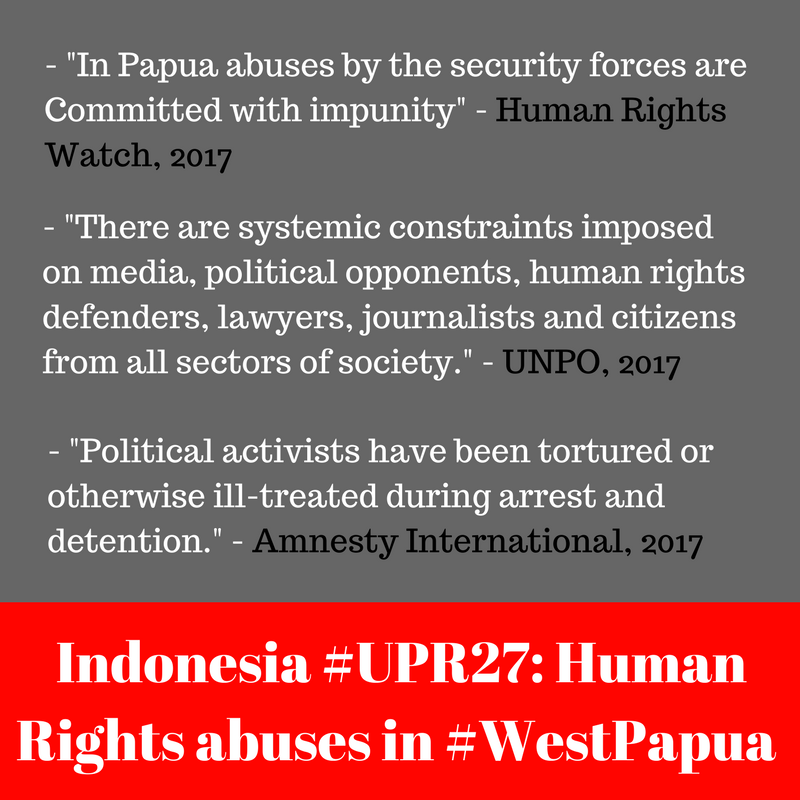 In the run-up to the Universal Review, several organisations submitted evidence of severe ongoing violations of human rights in West Papua. Amnesty International noted “hundreds of arrests of peaceful political activists, particularly in Papua”, tracing it back to the charge of ‘rebellion’ under Articles 106 and 110 of the Criminal Code which can lead to Papuans being arrested for life for simple expressions of pro-independence sentiment. Amnesty also stated that it regularly receives “credible reports of unlawful killings and unnecessary or excessive use of force and firearms by the police and military personnel during peaceful pro-independence protests and gatherings”, a routine occurrence in West Papua. Human Rights Watch documented 37 Papuan political prisoners, usually arrested for non-violent actions such as raising the Papuan Morning Star flag. The organisation noted that “Indonesian authorities also continue to restrict access by foreign journalists and rights monitors to Papua”, following on from its land-mark report into the restrictions in late 2015. Various countries raised concerns over West Papua in their speeches at the UN, including Mexico and the United States. Numerous observers ridiculed Indonesia’s double think, hosting World Press Freedom Day the day after arresting 200 non-violent demonstrators and beating journalist Yance Wenda. The Guardian’s First Dog on the Moon cartoon ran an entire strip about the issue, referencing the 1998 Biak Massacre and ban on journalists. UK MP Andrew Smith also showed solidarity with the West Papua struggle.